UPB: You started your film making when you went into a nursing home to see what life was like near the end. What inspired you to create Room 335? Andrew Jenks: I got into film making when I was a freshman at NYU living in a dorm with 300 strangers. At the time, my grandpa was in a nursing home and was diagnosed with Alzheimer’s. I thought it would be really interesting to see what life was like from his perspective, and see what that subculture was like. At the same time, I wanted to make a movie or documentary, not just short clips for class. All combined, I came up with Room 335. UPB: What originally interested you in film making? Jenks: My father worked for the UN so we always moved around. Through all the travelling and boredom, I really got into story telling. Through all the storytelling, I found the best medium to be through film. UPB: How did you get started with your own MTV show? Did they approach you? Jenks: After MTV saw the HBO and ESPN documentaries, they were interested and contacted me. They really liked the idea of me entering into various subcultures of different youth. From there, the show was born. UPB: You’ve followed a rapper, a teen with autism, a homeless girl, a fighter, a poker champion, and more. What was the scariest moment? Jenks: The scariest episode was the one when I followed around an Animal Rescuer. We were infiltrating illegal slaughter farms owned by the Cuban Mafia. It was so intense that no crew could come with us. It was just myself, a camera man, and the girl. We would flinch at any sound or crack. It got to a point where we didn’t feel safe anymore and had to call in the van and leave. Jenks: Every story is so different and unique, it’s hard to pick the most inspirational. It’s kind of like trying to pick your favorite kid. However, I will say one of the most touching story’s was the houseless girl from San Francisco, Heavy D. She was living on the streets, but trying the hardest to make little steps to make her life better. UPB: What was the biggest surprise? Jenks: The biggest surprise was when I was following Nick, the poker champion. During filming, he let us tape his therapy sessions, which was a huge surprise. It was really cool to see him tough enough to open up and be so vulnerable in front of a large audience. UPB: What goes into selecting the different individuals you follow? Jenks: We pretty much have free reign of who to choose to follow. Sometimes they could be recommended by someone, other times we have an idea of what type of person we want to follow and seek them out. UPB: If you could shadow anyone’s life, past or present, who would it be? Jenks: Umm….that’s a hard one. It’s really random but I’m fascinated by Marie Antionette. I just watched that movie last night and she seems like such an interesting woman. I’d like to see what her life is like. UPB: Why did you want to do a college tour? Jenks: I really wanted people to hear more about the stories of the people I’ve followed, as well as share my own story. It’s cool to be able to come to colleges and be able to relate to the audience that watches my show. I can tap into their interests and try to bring that to the show. UPB: What’s the number one lesson you’ve learned along the way? Jenks: Never take no for an answer. If you accept no as a response or a solution, you will never get anywhere. I use no as a starting point now. No is kind of a turn on…unless it’s in relation to girls. Then it’s bad! UPB: Lastly, what are your upcoming projects? Jenks: We are currently casting for the second season of World of Jenks. The only subject I know we are going to follow is a soldier. I’ve been wanting to do that for a while, and now I have the chance too. 5 to 10 years from now, I hope to get into more fictional stories and movies. Getting a movie in theaters would be awesome! Think about heading, by yourself, into an environment you had never even thought about before. This is what Andrew Jenks does on a weekly basis. As a young documentary filmmaker Andrew Jenks is interested in showing his generation what the world is really like. His series on MTV, World of Jenks, premiered this past September and was an instant hit. On his documentary series, he spends one week in extraordinary people’s lives. Some of the Jenks’ subjects were a homeless woman, a rapper, and a man living with autism, a NFL cheerleader, and a rising comedian. Jenks’ college tour is now underway and he will be traveling to colleges all over the United States in hopes of spreading the word of his experiences and teaching his generation all that this world consists of. He will make his JMU debut on February 17th and will be speaking about how he got his start, what he’s been doing since then, and what he hopes to accomplish in the future. On a past episode of World of Jenks, Andrew spent one week shadowing and recording a young comedian’s triumphs and pitfalls. He followed Dan St. Germain around documenting each gig he performed. Jenks was with Germain before and after each show and really showed the world what these young comedians go through. His audience got to see that comedy isn’t always funny, and it takes actual work, rehearsal, and dedication. The viewers were mentally submerged into Germain’s world for an hour or so but had the opportunity to take so much more out of the viewing experience. For once on TV it wasn’t about the sappy, good life story. The audience saw a man put his heart and soul into a career only to be told that he didn’t have what it takes to make it big in the comedy world. 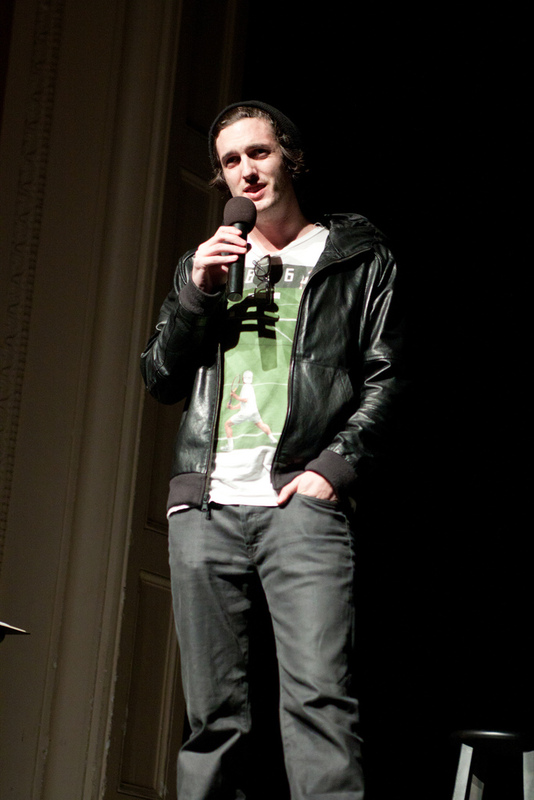 On Thursday Feburary 17, 2011 Andrew Jenks will be appearing in JMU’s very own Wilson Hall. Tickets are available now at Warren Box office for $5 in advanced and $10 at the door, for students and the general public. Doors will open at 7pm and the event will start at 8pm. Come out to hear about Andrew Jenk’s amazing journey to show the world what’s actually happening outside their own front door. UPB is excited to welcome documentary filmmaker Andrew Jenks to JMU. He is featured on MTV’s show “World of Jenks,” where he lives for a week in the life of diverse and inspirational people across the country. Jenks says of the show, “Every young person I meet has a unique way of speaking to our generation. Their story is personal but their message is universal: to make a difference and leave their own unique stamp on society.” This Thursday at 8 pm in Wilson Hall, Jenks will talk about his experiences, show clips from his show, and conduct a Q&A session. Inspired by his upcoming visit, check out our parody video featuring UPB’s own “Anthony Banks”!